I vividly remember my first visit to the country. My sister, Batgirl and I had decided to catch the ferry from Spain to Tangiers. For some reason we were really nervous about our first venture to North Africa. So when we called home to Mum, we were careful not to mention our impending Moroccan adventure. I’m not sure why we were so worried, because we absolutely loved our time exploring the medinas and souks of Marrakech and Fez. Not to mention the breathtaking bus trip over the Altas mountains to the desert border town of Ouarzazate. It should go without saying, I was captivated by the food. From the wonderful variety of meat tajines (stews) flavoured with figs or dates, to the street food kababs, to succulent stuffed eggplant, to the tangy lemon chicken, to thick lentil soup known as harira, to the sacred couscous with seven vegetables. I wanted to eat it all. Unfortunately, I did eat it all. Including some irresistible salad which made me very sick and cut short our Moroccan voyage as we legged it back to Spain to ride out the food poisoning in a hotel room with Western toilets. While I’m still yet to voyage back to the land of couscous in the flesh. I’ve been exploring her cuisine in my own little kitchen, with many wonderful books as a guide. One of the things I love the most is how exotic and unusual the flavour combinations of Morocco can taste to an Australian girl, but the ingredients themselves are so commonplace. Take lemons and salt and let them hang out for a while and you end up with the super-lemony fragrance of preserved lemon skin. Take roasted peppers and a good deal of chilli and a few key spices and you end up with harissa, the best hot sauce ever. I hope you’ll have a go at adding a little Moroccan exoticism to your own cooking. Here are a few tips to get your imagination going. Once your lemons have been sitting for 4 weeks, they’re ready to use. But the crazy thing is that you’re going to dig the lemon out of the jar, remove the flesh and discard it. It’s the rind that you want. I find it best to rinse the rind well under the cold tap to remove the excess saltiness. Because these little beauties sure are salty. Be warned: a little goes a very long way. – finely chopped and tossed in with your salad dressing for a fragrant surprise. – finely mince and sitr a little into some natural yoghurt for a wonderfully versatile savoury yoghurt sauce. The first cookbook from the London restaurant of the same name, I can’t tell you how much I love the work of the Clarkes. While I absolutely love all of their three cookbooks, I’d recommend starting at the beginning as this is where they capture all the classics. One of those rare books written by chefs that translates effortlessly to home cooking. Have been plotting an excuse to visit London and eat at the restaurant for years now. One day. I’m a huge fan of Claudia Roden. She writes in a wonderfully engaging way. While her Book of Middle Eastern Food is more comprehensive than this volume, I find it much more approachable. Call me superficial, but I always prefer a cookery book with pictures. Divided into 3 sections covering Morocco, Lebanon and Turkey this is my first go-to book for Moroccan home cooking. Arabesque by Greg & Lucy Malouf. A lot more cheffy than Claudia’s Arabesque, this is my favourite book from the wonderful Melbourne-based Greg Malouf. It focuses on all Middle Eastern food with recipes and details organised by ingredients. So is a wonderful go-to for inspiration, although I often find the recipes one the more complicated end of the spectrum. 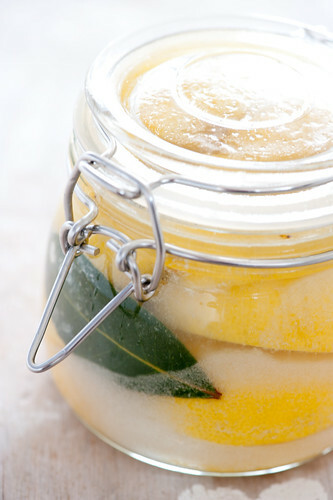 See my Preserved Lemon Recipe over here. See my Home Made Harissa recipe over here. And these will make great Christmas presents! By the way, I’ve been making your no-knead bread recipe – absolutely delicious and so easy. Thanks. I love this blog and your recipe book too. i’ve been wanting to make preserved lemons for a long time. this looks simple and delicious! I’m excited to try the harissa recipe – great way to slim down to 5 ingredients. Thanks so much for these – two ingredients I love and was just thinking the other day I should learn how to make for myself! Looks fantastic! I can’t wait to make my own preserved lemons. It also looks like it would be a great homemade Christmas gift. I just wanted to say thank you for the time you put into this website. I have become interested in cooking recently but have been discourage about how much work there always seemed to be, especially with stuff I didn’t understand. Stonesoup has completely changed my view on that and yesterday I cooked 4 of your recipes that were super simple and amazingly delicious. It got me excited to cook all over again. And don’t forget Ras el hanout! it turns a can of tomatoes, chickpeas and bottom of the fridge vegies into a perfect vegetarian tagine! If you are ever in Melbourne do check out Maha – sublime food & great service (and a wee vial of the house blend Ras el hanout as a take home gift!). Brilliant blog btw – addicted to your butter chickpeas and carrot cake. Thank you! I went to maha when it first openend – you’re right i need to get back there. brilliant idea on the christmas gift front – love it! Thank you for the harissa recipe! I’m mildly obsessed with spicy heat (and Bogart), so this is right up my alley! I may have to bring Morocco home instead and try out these lemons… I’m looking for a way to use lots of salt. Thanks for the recipe! Thanks for publishing this blog. Sounds very tasty. The food in Morocco is great. 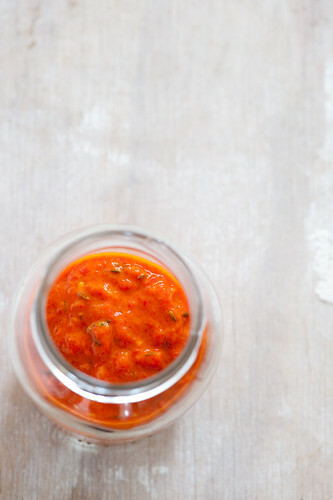 Thanks so much for this wonderful sounding recipe for harissa – love the simplicity of 5 ingredients and can’t wait to try it! I’ve been wanting to make preserved lemons for a while now, and this is the easiest method I’ve seen – thanks so much, Jules! they’re so fun to make and the jars look really cute – my type of preserving! yes do take morocco home – the best way to experience it if you can’t travel there at the moment. the lemons sound pretty amazing, too – one of those simple things that add a unique taste, from the looks of it. we (my m other and me – were the resident middle-eastern-loving fraction in the family) recently tested your butter chickpeas. we went for the chickpeas as a side to some lamb meatballs. for some weird reason, my mother thought this would be one of those recipes you can eat endlessly from, and are hungry half an hour later, so she made buchteln – austrian sweet yeast dough pastry, filled with plum jam – with vanilla sauce. we were in for quite a surprise (i underestimated how satiating the chickpeas are, too, just not as much), and felt rather stuffed for the rest of the evening. It’s unclear whether you mean fresh chilis or dried; every other recipe i’ve seen uses dried but I took yours to mean fresh. Maverick that I am, I’ll probably use both, but I’d love to know what you use. I’ve used fresh here but either would be fine..or even better both! Hey, I know this is about making food more exotic with Moroccan flavors but I was wondering about how to make Indian flavors. I just saw the movie Today’s Special and now I have a craving for Indian food! thank u specialy for preserved lemon ,i realy like your taste in cookin. Jules, I keep my lemons in the refrigerator otherwise I get nats flying all over the kitchen. I’ve always wanted to know how make preserved lemons. 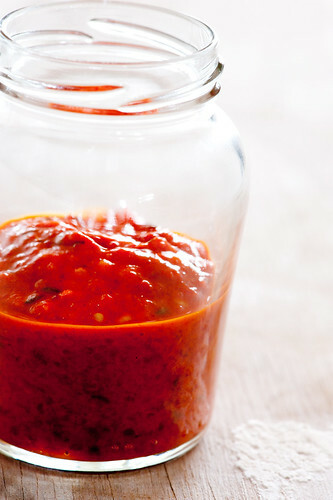 Me and my hubby love… hot and now I can make my own harissa. Thanks Jules.